Marshall Mathers aka Eminem has recently announced that he is will be dropping his long awaited “Marshall Mathers LP 2” on November 5th. Yesterday he dropped the music video for the his first single titled “Berzerk” . In the video he sported a Detroit Pistons back to back championship shirt from the bad boy days. 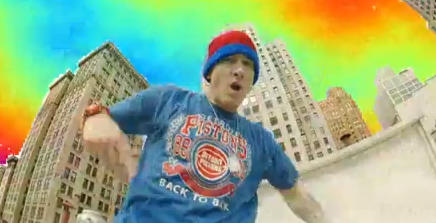 Eminem is a Detroit native and is a huge Pistons fan and proudly wore the shirt in his video. Lesser known Detroit based rapper Royce Da 5'9 also made a cameo sporting a throwback Grant Hill Pistons jersey. Sports apparel such as shirts and jerseys aren't really popular in hip-hop culture these days so I thought it was a semi big deal to see the biggest rapper in the world wearing a Pistons shirt in the 1st video for his new album. Since its upload to Youtube yesterday the “Berzerk” music video has received over 2 Million hits and counting. Glad he's paying homage to The Beastie Boys. Yeah you got torespect Em for that. My questions is... Where can we buy the Pistons shirt?